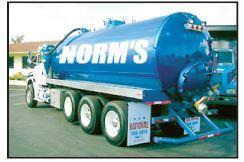 Norm&apos;s Pumping and Septic Service Inc is locally owned and operated. Norm&apos;s specializes in commercial and residential septic treatments. Including complete pumping services. Septic Enzymes are also available for sale and can be delivered. Norm&apos;s is a licensed & insured sewer and water lines specialist.Call today for all of your septic service needs!